“A hat is a magical, marvelous thing that sits on top of your head. For Christmas last year, my aunt gifted the girls with a box full of books. Books are always welcome around here – we can never get enough! But Zia C somehow always picks out the best books that no one has ever heard of before. . . and they quickly become favorites! 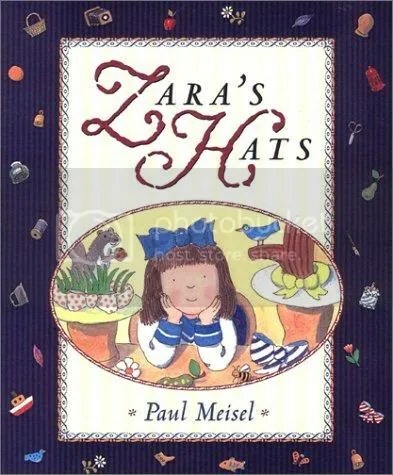 One of those titles is Zara’s Hats, by Paul Meisel. 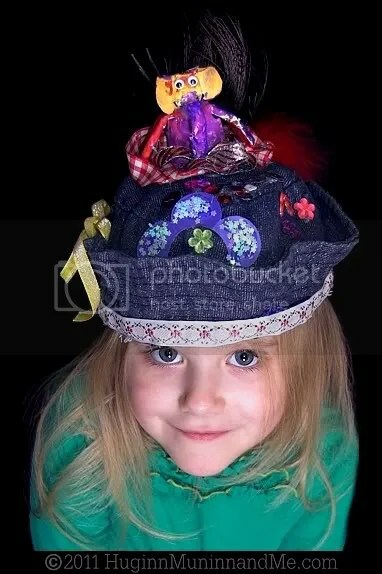 . .
It’s a really cute tale about a little girl named Zara, who helps her father design beautiful feathered hats to sell in their shop. One day, they run out of feathers, and Zara’s father Selig goes off on a cross-continental voyage to find some. While he is away, Zara misses her father terribly, and seeing the window of the hat shop dark and empty makes it even worse. She decides to decorate a few hats with Papier-mâché animals, flowers, and ribbons just to make the shop look cheerful again. To her surprise, her hats are a tremendous success, and sell out as fast as she and her mother can put them together! When Selig comes home (mysteriously unable to find feathers), he is so proud of his little Zara and her beautiful hats! This story is based loosely on the true story of the author’s great-grandfather, who ran a hat shop in the early 1900’s, and his grandmother – Zara. There’s even an old black and white photograph of them on the back cover, which Teagan and I think is really neat! It should come as no surprise to you that our crafty little Puff wanted to make her very own ‘Zara’s Hat’ pretty much from the moment we finished reading the book for the first time! We started with Papier-mâché – just like Zara did in the story. T has never crafted anything this way before, but she caught on very quickly and had a great time with it. 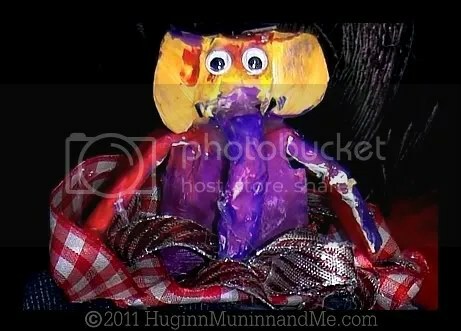 Of course she chose to make a brightly colored (mostly purple) elephant, and did a darn good job of it (with just a little bit of help). For some unknown reason she decided that he didn’t need legs. . .
Isn’t it a beauty??! 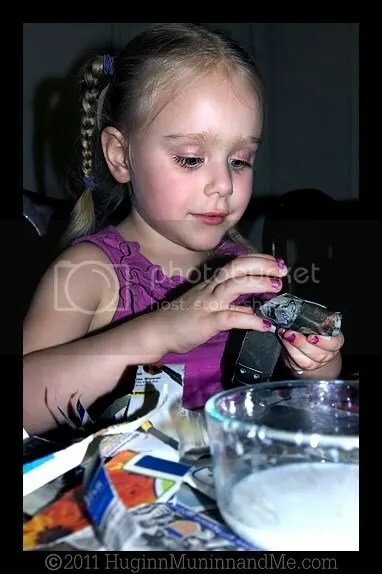 She is so proud of her creation, and yes. She actually WEARS the thing. Like, out of the house! It’s absolutely ridiculous, and so completely adorable that I can’t help but get a big grin every time I look at her! You only get to be four years old and rock a hat that awesome once in a lifetime. . . and though I do wonder if deep down inside she knows how utterly silly she looks, I will never be the one to tell her! old age. Where do I put my order in for one? You told me all about it, but now I get to actually see it. Pretty cOOl! I could never craft something like that! I love T’s hat! And I totally agree, that elephant doesn’t need any legs at all, it’s sitting in the hat just perfectly. T looks so beautiful in her hat, I just LOOOVE the second to the last picture of her. Talk about a fabulous photo. 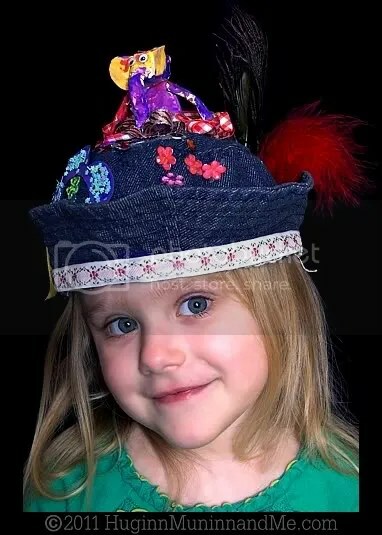 My little girl loves to wear hats, and she puts all kinds of items on her head, be they hats or not. Accessorizing is so much fun. T did a marvelous job and I enjoyed this post a lot.